Technology outfit, Rambus, is seeking to revolutionise the Internet of Things by bringing dirt-cheap visual sensors to the party. Rather than focusing on the refracting properties of light, its engineers use diffraction to capture data rather than an image. Unlike a traditional affair, Rambus' lensless visual sensor shuns image quality, precision and colour fidelity – it's all about simplicity. While it won't allow you to tell blue from yellow (everything is in greyscale), you will be able to distinguish forms and basic shapes (e.g. the number of fingers on one hand). 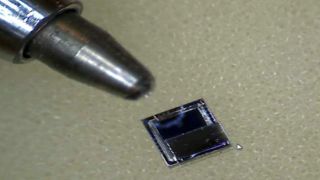 Although that might initially seem detrimental, it actually helps alleviate privacy fears that might arise due to the near-microscopic size of the Rambus sensor. What's more, it is extremely thin and small, very cheap to produce, has an extended depth of field, a very wide angle of vision, works with visible and invisible light (UV, IR) and its power consumption is in the microwatts. Dr Patrick Gill explained to us that the sensor is ideal for ubiquitous smart sensing, before adding that "producing a normal lens that size is near impossible". Applications for this technology are near limitless and involves anything that uses point tracking, image change detection, object recognition, range finding and so forth.